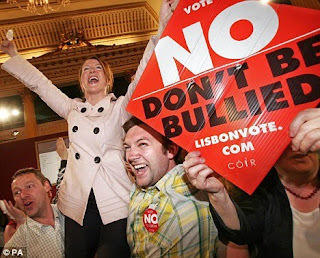 The Irish people go to the polls tomorrow for the second time to vote on the Lisbon Treaty, aka the EU Constitution. The French "Non" was ignored. The Dutch "Nee" was ignored. The Irish "No" was ignored. The future independence of the UK, Ireland and every other country in the European Empire lies in the hands of the Irish people tomorrow. Will they be taken in by the EU-funded propaganda and the lies they have been told about the non-existent "guarantees" which have no legal basis whatsoever? It's just too close to call, they have been subjected to a sustained propaganda campaign from the Irish and EU governments. We'll have to wait and see and hope the Irish people do the right thing. Margaret Beckett has just said on the Daily Politics that UK only has had referenda when Constiutional matters are at stake and therefore it is not appropriate on Lisbon Treaty. Another one who hasn't read what's in it! The British public is only just waking up to the massive transfer of power to the EU, that has taken place in Britain. It is crazy that the Irish should be deciding the future of Britain. Is Britain a democracy or not?